The last thing Drusilla expected to find on vacation was a gorgeous man hiding in the jungle. But what is he running from? And why does she feel so mesmerized that she’ll stop at nothing to be near him? Zetithian warrior Manx, a member of a race hunted to near extinction because of their sexual powers, has done all he can to avoid extermination. But when an uncommon woman enters his jungle lair, the animal inside of him demands he risk it all to have her. Until he saw her, his loneliness threatened to consume him. Would she risk life to join him…or would their intense pleasure in each other destroy them both? 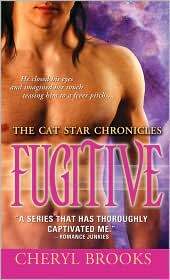 This is the 5th Cat Star Chronicles book and I can’t wait for #6. Manx might be my favorite “cat”. Manx managed to escape from the Nedwuts and is the only character who wasn’t sold into slavery. He has been hiding out on different planets for several years, but is more than ready to find his mate and be with someone else permanently. Enter Drusilla. Drusilla is enjoying a working vacation, but also wishing for something more. These two are fantastic together, but what I liked even more than the romance was the way the hunt for who had destroyed Manx’s home planet move forward some. Also, I loved Jack, Cat, Leo, and Tisana making an appearance! I did think it moved a little slow in the beginning. I wanted Manx and Drusilla to meet each other way before it happened. I would say that this book could be read alone, but would probably be best if read with the other books.